With 16 shades in this beautiful seasonal collection from China Glaze, I'm not even going to begin an attempt to swatch them all at one time! My sincere admiration goes out to those bloggers who are able to do that. We just ended our monthly contest giving one lucky winner the entire set of 'Tis the Season to be Naughty or Nice, and we're going to keep with that giving spirit and give away another set, only I'm going to do it by individual bottles this time. I wasn't certain what/if/when I would receive from China Glaze to review, so I went ahead and ordered a set from Victoria Nail Supply, which is going to be here tomorrow. When I saw the first promo pictures, I knew I had to get them all! China Glaze sent me the complete set, so that leaves me with 2 sets. So every time I post something from this collection, I'll be giving that shade away (new ones). Below: Peace on Earth is described in the press release as an olive green shimmer. That's an accurate description, and it also has a delicate veil of gold that seems to overlay the finish. This 2-coat medium olive shade has some charcoal in the base, allowing for a completely opaque look. 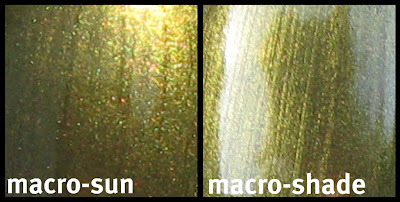 Above & Below: The shimmer is multi colored, but it's very subtle and doesn't distract from the base color. 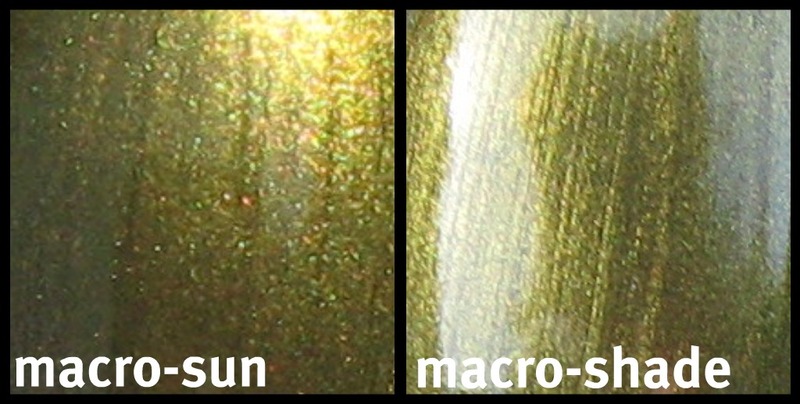 Below: The multi colored shimmer all but disappears in the shade, leaving the gold "overlay" to take center stage. Having a fondness for green shades, this one is going to be well-loved by me. It's nice for the holidays, but also perfect for Fall. The application was very good, and I'm always pleased to see a little charcoal around the inside of the bottle neck, because I know I'm going to get great coverage when charcoal or black is used in the base formulation. If you'd like to win a bottle of Peace on Earth, just leave your eMail in the comments section (followers only, please). I'll leave the entry period open until I do my next post (sometime tomorrow), and the winner will be chosen by Random.org and announced in tomorrow's post. gorgeous color! I'm really looking forward to trying that one out! This is such a gorgeous color! Like you said, great for holiday but also for all of fall and winter. This is so pretty :) Looks lush. soco210 at yahoo dot com =) thanks! Hullo! Please enter me. I follow you via GFC. My email is kirby.monk (at) gmail (dot) com. Do you know how close this is Nars Mash? It's so nice of you to do so many giveaways! this is the colour that really caught my eye when i saw the collection previews...i love it more now that I've see the swatch! thanks! Please enter me in your giveaway. Love this olive green. Hope it's a dupe to Moonpool! Follower on Google Friend Connect. Thank you. fun! i can't wait to see who wins! Ooh, that's a perfect green for Fall! This collection is so amazing. I think I may want them all. So pretty! Much prettier than I expected.. It's going to be hard only buying a few of this seasons new polishes! Oh dear! Please enter me:) I follow via GFC and my email is fleurs dot nails at gmail dot com! its so pretty! I would love to have one. I follow as Jenny$1983 using GFC, my email address is jennys1983@hotmail.com. I follow on GFC. Thanks! I didn't get Peace on Earth because it looks so similar to OPI At Your Quebec and Call but all the swatches I've seen are making me regret it! Do you know if it's a dupe for AYQAC? Oh and if it's not too late for the contest, my name is Shayo and e-mail is moonshinebetty@gmail.com. 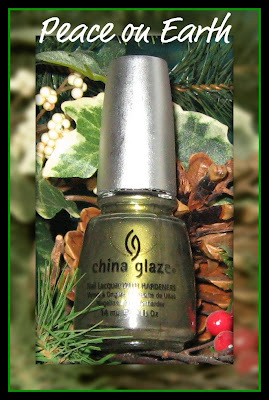 Peace on Earth looks like Zoya's Irene. Shayo, I have AYQAC - it's similar to PoE, but they're not dupes. PoE is more green, cooler. I like this one a lot. Pretty and can't wait to see more! Please enter me. I am a follower via GFC and my email is kirby.monk (at) gmail (dot) com.